1. To identify a present day conflict. Make sure to include who is involved & the reason for the conflict. 2. Give advice to the current day conflict parties from people who resolved a historical conflict. Use the Characteristics of Successful Learners, Thinking lenses, or a strategy to guide advice. Based on the historical conflict you studied, you will choose a current day conflict. You will create a comic strip that informs readers about your present day conflict and the advice they are being given. The first page of your Strip Design should provide information about the present day conflict. *It is wise to choose a Title Page with 1-3 panels. The remaining pages will be organized by pieces of advice. Each piece of advice will be ONE page. When added longer pieces of text do not use text cells or speech bubbles, use TEXT BOXES. *Use the + button, select balloons, and choose text box. 5. Then select "Open in.."
2. Select "Add to Resources"
3. 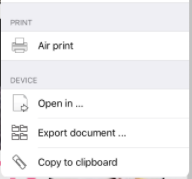 Choose "Home" and then select "UPLOAD"
4. 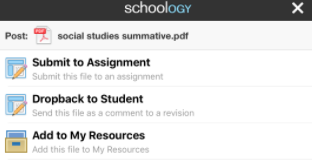 Go to the Schoology Discussion and select "Attach RESOURCE"